We’re back for the new year and more Nintendo-related mischief! 2014 is a big year for me–development for Tadpole Treble is well underway and it’s truly exciting to actually be making a video game of my own at this point. Even in the midst of that, though, you’ll be able to catch new comics each Tuesday and Friday, right here. Thanks for your patience over the break! Today’s strip is something of a more elaborate version of strip 482. 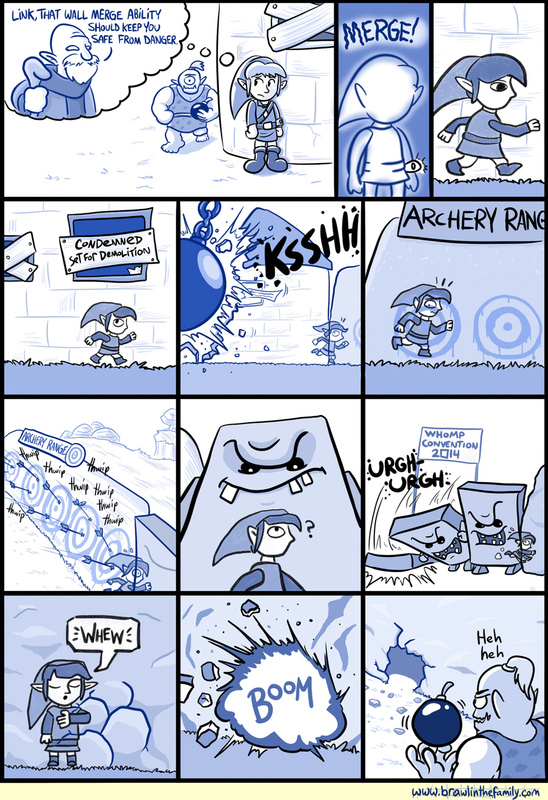 I love doing this sort of “comic escalation” whenever the opportunity arises, so I couldn’t help revisit Link’s issues with wall-merging here. On a related note, A Link Between Worlds surprised the heck out of me; I actually thought it’d be kind of a bland, disposable experience and I ended up completely loving it. Serves me right for doubting the Big N and the Big Z.
We’ll talk in more detail about ALBW and several other titles from 2013 in an upcoming podcast! And speaking of which, the podcast links SHOULD be working in the side tab now, finally. Plus, the “Next Button” issue a lot of you were having should be fixed too. For now, though, I’ll just leave you with the reminder to check back here twice a week for a return to the regular schedule.